For as long as I can remember I’ve had a picture of a plane flying over clouds and mountains. It had that grey, crome look that lots of 1950 art had. It was the front of a card, probably a birthday card but I don’t remember it ever having the back. 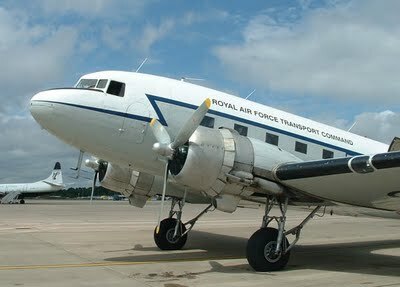 I do remember the plane was a Dakota, otherwise known as a C-47 Skytrain, a transport plane developed from the Douglas DC3. Today I got to go one better than the card. I got to go in a C-47B-15-DK built in 1944 for a flight from Liverpool John Lennon Airport. It was the first time I’ve ever been in a plane or through airport security, an experience of a different kind in itself. We went up the river seeing New Brighton, the Runcorn bridge and various bits of the city. At times we were in cloud and at times the sky was clear. It wasn’t as bumpy as I’d thought it might be and the cabin wasn’t as noisy as I’d expected. When you see Dakotas in films everyone is shouting. You’d have to raise your voice to be heard but not yell. Words to describe the experience fail me. It was very, very cool. Sadly I can’t find the picture now in amongst the assorted cards I’ve kept. It may be somewhere just waiting to be found when I’m sorting out or it may be the only copy I have now is in my head. OMG, that is just the coolest -- I love planes! The line for parachutist to clip onto run along the aircraft roof. I can't swear it's the original 1944 item and not something put in during restoration. It was quite civilised. I heard serveral comments that there was more leg room than on most modern planes. The plane in the photo looks much more civilised. I've been in three propeller driven plans before, and all were exciting flights.